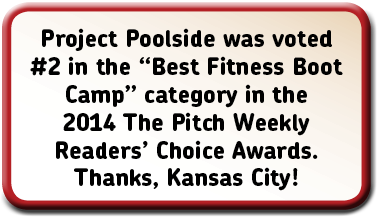 Project Poolside: Quickie is a Kansas City's "original" class designed for those people who would like to start working out ... but a full hour is a little too intimidating. 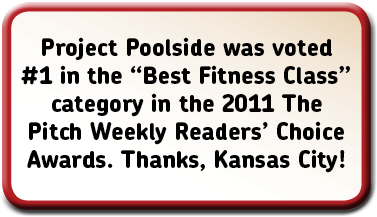 It is a way that you can ease into the full-hour Project Poolside class. Also for those who are limited on time, take the half hour "Quickie" to squeeze in a short workout. Is your attention span short like mine? Take the 30-minute "Quickie." You'll never get bored ... because the time will fly by. This is a 30-minute session that focuses on your core. Yes, that's 30 whole minutes of attacking the area most people say is their trouble area. Why do it? Why not! Are you really going to do it at home ... without others around you to whine to? Trust me ... we're all whining in unison [the instructor included].